Hola Lola: My nerves hurt! Tia Molly, Tio Ben and Doss came in a few weekends ago for SXSW. This is Lola being sweet! 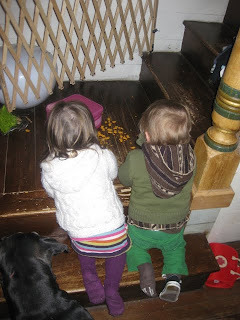 Then, she decided to take her goldfish crackers and dump them all over the stairs. This is Lola being bratty. Doss and Lola were scavenging for the fish. Soon Lady Bird and Bella would join them. Love the on-call vacuum cleaners. My nerves are in deep deep pain lately. It's kind of gotten insane around here! Miss Lola has REALLY kicked it into HIGH gear now! What am I referring to? The toddler fits, the back talking, the hitting, etc. I think they call this stage the "terrible twos" but in our case it's considered the "TERRIBLE twos". Seriously, I can't put enough emphasis on the "terrible" part to even begin to make you understand what we've been going through over the past several weeks. It seems lately Lola's personality is split 80/20. Meaning she is whining, crying and mostly hysterically screaming 80% of the time and she is an adorable bundle of joy the other 20% of the time. Not even kidding. The worst part is the 20% doesn't come in one big block of time. It's usually sporadically spread out it between little fits. So, this means we're constantly walking on egg shells wondering what the next thing will be that will send Lo in a tailspin. My stomach is constantly full of knots lately. HOW LONG DOES THIS STAGE LAST??????????????????????? The fits....Well, at this point, I feel like I can barely function and I'm always on the verge of massive tears. Literally, I have a permanent migraine headache. The fits are really more than I can handle. The worst part is they can last up to an hour and a half. What are you suppose to do? They say to ignore it so we do. But when you're child is beet red while flailing on the ground and can barely breath, it's kind of hard to do the whole ignoring thing. Of course, when I try to console her, this results in a bunch of exorcist style NOs, kicking and more out of control screaming. I'm beginning to think things aren't normal. All the books and everyone says it is but this seems really extreme to me. I understand Lola has a very strong personality so the fits may be a little more intense but I'm doubting everything right now. This morning when Lola woke up screaming something horrible crossed my mind....I once heard that when a toddler screams non-stop (80% of the time) this could be a sign of leukemia. Yea. It's so bad that stuff like this is crossing my mind. Crazy and scary. SO, I became one of those psycho moms and I made an appt with Dr. Mirrop for this afternoon. She also has a running nose, runny eyes and a cough so I'll use that as my main excuse for being there and then slip in the leukemia thing in the end so he doesn't think I'm a complete nut. I'm being serious though...something just ain't right with the little girl right now! It's not just the hysterical fits. It's also the way she acts most of the time in public which translates into HORRIBLE! No need for us to try to go out to eat anymore as we'll be walking out embarrassed without any food. Or, this past weekend for example, we went to a birthday party which was outside where Lola could run around free and do whatever she wanted. Well, we ended up having to make a quick exit with Lola screaming in our arms. What started this fit? She was making a mess with a water jug. I asked her to stop and she wouldn't listen of course (she NEVER does) so I pulled her away. She flipped and that was the end! Pure embarrassment! Oh...have I mentioned that she also tells me to "Shut up" all the time and swats at me. Uh-huh...SERIOUSLY!!! Oh man...I can't even begin to tell you everything else that has come along with this stage. I always said I never wanted one of those children who threw little fits in public. I've always referred to these kids in the past as "brats". Well now here we are....we have one of them. I tend to look back and put blame on myself. I think "Where did we go wrong here?" - "Have we failed at setting boundaries?". We've always done so good at trying not to be "helicopter" parents. We've tried to let Lola discover herself and things in this world on her own...let her be independent....is this the problem? Of course, Clay keeps saying this is completely normal and we didn't do anything wrong. At this point, I'm doubting everything. Surely it will get better soon. With this, I thought it would be fitting to post a video of Lola with Doss. 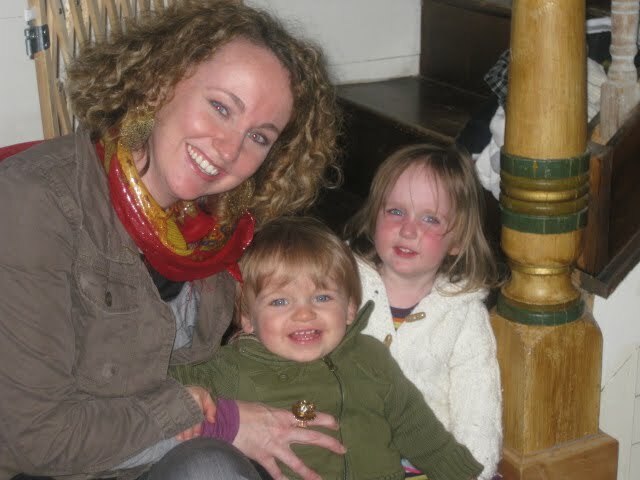 She tends to be a little rough with both baby Curry and Doss. With Curry she is soooo sweet . She always wants to rub her or give her a bottle or coddle her or hug her but she doesn't realize that she's a baby and she has to be very careful. She's the same way with Doss but luckily he's a little older and not as breakable. I know her roughness is not at all intentional but sometimes I feel like I'm watching Lennie with the rabbit (or was it a kitten) in Of Mice and Men. I'm really hoping she will get a better understanding of the word "gentle" before baby #2 gets here. Goodness gracious.